Yet another duo, and consequence of many years of collaboration. We are about to release our debut CD “Party in The Piano Shop”. We play a mix of our own compositions and have a very rich variety of stiles and moods within our repertoire. Our concerts posses a certain “theatrical touch” as well. 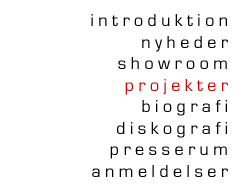 Learn more about Pojken on: pojken.dk and check out Flensborg/Venndt-Duo “live in concert” on Youtube or listen to the duo in Showroom. This duo is another odd constellation. Have you ever heard of a duo consisting of a double bass player and a chromatic harmonica player ? Well that is just what this duo is all about. An exciting and original blend of poetry and improvised music. Visit jorgenemborg.dk to learn more about this legendary Danish piano player with whom I am very proud to collaborate with. With this constellation I play strictly chromatic harmonica. 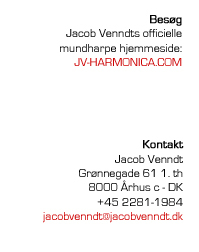 The repertoire is a mix Jørgens and my own compositions. I am very proud to play with legendary Danish producer, guitar player and composer Christian Alvad. With this band we play Christians smooth and catchy instrumental tunes. His latest album features me on harmonica on two tunes, and was nominated for a grammy for best folk-album, and won a grammy for best country-album at the Danish Music Awards this year (2008).